Abandoned autos and RVs parked from 85th ave to Jones ave. Parking enforcement still occurs on other local streets however it's not occuring here at edes ave.
OAK 311 has received this issue. Your service request ID is #890596. Please check back for status updates, or contact us directly at 510-615-5566. Any update on this issue? The RVs are causing the streets and area to rot. We are seeing an increase in illegal dumping and criminal activity as a result of their presence. Unequal enforcement of laws sounds like a lawsuit waiting to happen. why is this legal? i've seen Oakland tags cars with half covers and this is allowed with a full cover? OAK 311 has received this issue. Your service request ID is #892958. Please check back for status updates, or contact us directly at 510-615-5566.
why is this allowed?? there's no parking law that justifies the City of Oakland to allow cars to double park over night. there's over 10 cars at this residence 24 hours a day. OAK 311 has received this issue. Your service request ID is #892956. Please check back for status updates, or contact us directly at 510-615-5566. OAK 311 has received this issue. Your service request ID is #893017. Please check back for status updates, or contact us directly at 510-615-5566. They are freaking motor homes they need to be in a motor home park not out here $ucking the taxpayers dry. This is the second time I've posted this..PLEASE REINSTALL THE BUS STOP SIGN!! !...AC Transit drivers ignore or don't realize that this is a actual stop. OAK 311 has received this issue. Your service request ID is #892510. Please check back for status updates, or contact us directly at 510-615-5566. You will need contact AC Transit the PWD call center will not make the call. OAK 311 has referred this issue to AC TRANSIT,. Please contact that department to follow-up (see "Other Helpful Links" at http://www2.oaklandnet.com/Government/o/PWA/Connect/ReportaProblem/index.htm#Links). 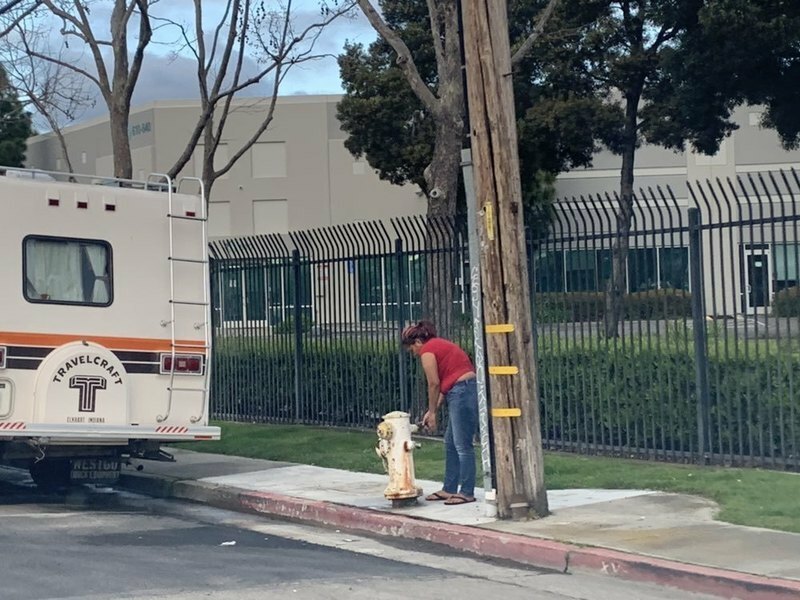 Fire hydrants are being opened up and tapped by homeless/ RV encampment. Constant water waste. Pleas upgrade the fire hydrants so they are not tapped. OAK 311 has received this issue. Your service request ID is #892608. Please check back for status updates, or contact us directly at 510-615-5566.
this container company is on a dirt lot during the winter all the trucks bring the mud out creating dust clouds when the mud dries is all over Coliseum way and 66th Ave. Are they responsible for sweeping up there dirt? OAK 311 has received this issue. Your service request ID is #892194. Please check back for status updates, or contact us directly at 510-615-5566. OAK 311 has received this issue. Your service request ID is #892661. Thank you, in advance, for your patience as we work through a backlog of pothole service requests. Unfortunately the City does not have enough funding to repave all streets in poor condition. With limited funding, our response to resurfacing requests is limited to minor pavement and pothole repairs only. Our Street Maintenance Department will assess your street and determine whether temporary measures might be appropriate. Please understand that this work may be limited to pothole or other minor repairs, and that we have many similar requests. We will do our best to respond in a timely manner. The backlog of streets in Oakland needing pavement currently is $435 million and growing. Green Van filled with trash has been sitting in the same location for now going on 7 months. This is making it hard for AC Transit vehicles to stop at the bus stop and for people entering and exiting the park. Sweet sweeping could not be done due to the stationary vehicles. Oil is dripping from vehicle. These people are not from the area in fact are from the Central Valley taking advantage of the neighborhood. It is now attracting other vehicles with no tags as well. Please ticket vehicles and orange tag them. OAK 311 has received this issue. Your service request ID is #890584. Please check back for status updates, or contact us directly at 510-615-5566. OAK 311 has received this issue. Your service request ID is #892407. Thank you, in advance, for your patience as we work through a backlog of pothole service requests. Unfortunately the City does not have enough funding to repave all streets in poor condition. With limited funding, our response to resurfacing requests is limited to minor pavement and pothole repairs only. Our Street Maintenance Department will assess your street and determine whether temporary measures might be appropriate. Please understand that this work may be limited to pothole or other minor repairs, and that we have many similar requests. We will do our best to respond in a timely manner. The backlog of streets in Oakland needing pavement currently is $435 million and growing.